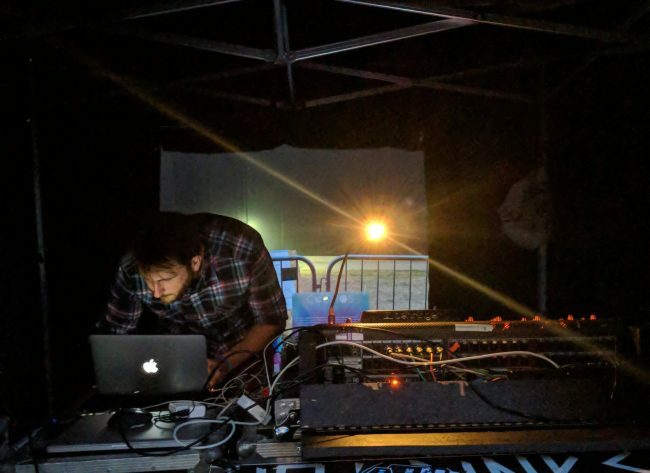 As part of the COSMOS art-science residency at Jodrell Bank Observatory, Simon Jackson, an acoustic designer at Arup, worked with artist Addie Wagenknecht and Abandon Normal Devices to produce an immersive 360⁰ soundscape for Hidden in Plain Sight. 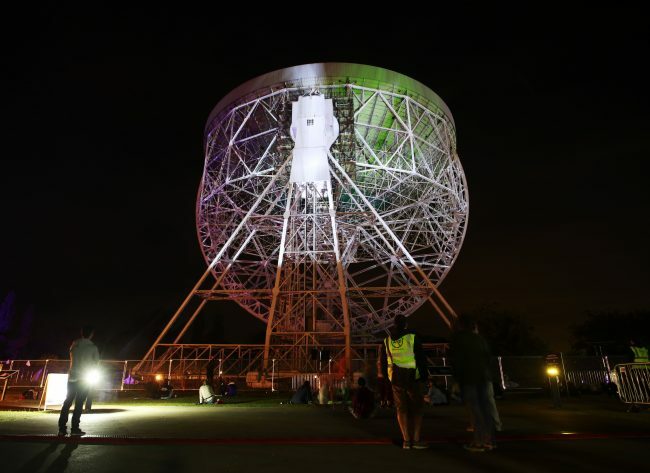 The soundscape accompanied visuals, created by Wagenknecht, which were projected onto Jodrell Bank’s iconic Lovell Telescope during bluedot festival 2018. What does space, data and the internet sound like? Drawing on parallels between space and the internet as described by Addie Wagenknecht, Hidden in Plain Sight was accompanied by an immersive soundscape composition that tried to answer just that. Informed and generated from data sets which have been collected at Jodrell Bank Observatory, Addie’s visuals modelled patterns that occur within deep space. Our vision for the audio composition was to create an aural connection to the visual patterns which were projected onto the telescope. By adding an aural dimension to the installation, this helped reimagine the data and the constant journey of discovery through space it had long since embarked upon. My first challenge was understanding the connection between pulsar data – received by the telescope – and sound. A pulsar is a highly magnetised neutron star with a radius of 10-15 km. Electromagnetic radiation is beamed out along it’s poles and is detected as pulses as the beams of radio waves across the Earth – in the same way as a lighthouse can be seen when the light is pointed in the direction of the observer. The radio signals from these spinning neutron stars contain different temporal patterns arriving from different directions in deep space. When analysed further, the signals also contain spectral information – as if each pulsar were a unique rhythmic instrument played light years away from Earth. The pulsar patterns and data are fascinating from a sound design perspective – save for the fact the signals are not actually perceivable as sound. The human ear can typically hear in the frequency range 20Hz to 20kHz. Pulsar signals are in the radio frequency range upwards of 100MHz. However, scientists at Jodrell Bank Observatory have created sounds that are direct translations from the radio signals received. I was inspired by the idea of pulsars as musical instruments and used pulsar data, sent to us by Rene Breton, Reader in Astrophysics at Jodrell Bank Observatory, to create a different sonic interpretation for COSMOS 2018. Sounds within the soundscape composition are based on the unique rhythmic pattern, observation frequency and frequency spectrum shape that is specific to each pulsar – giving each pulsar sound its own unique aural character and musicality. When these sonic interpretations are played together, their temporal patterns – or beats – weave in and out, creating intricate, complex rhythms and syncopation. The result is a curious, constantly evolving relationship of sounds – a stellar rendition of Steve Reich’s Music for 18 Musicians. Particular data was selected for the piece that correspond to the radio-waves emitted by the brightest pulsars in the sky including: CP1919, the first discovered radio pulsar (J1921+2153), the Double Pulsar (J0737−3039) and the Crab Pulsar (J0528+2200) amongst many others. 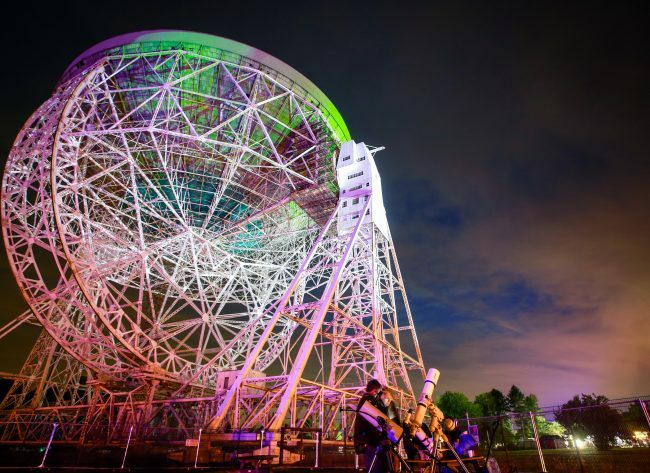 As Addie described to me, the Lovell Telescope is a network point that extends into the universe and connects us to an infinite amount of radio astronomy data. The success of the telescope in making new discoveries is in some ways dependent on machine learning here on Earth. I designed the soundscape to incorporate familiar computer sounds that are granulated and processed beyond recognition. This created swells and harmonies which circumnavigate the observer and, at their apex, mask the distant pulsar sounds until a later point when they appear to re-emerge. When composing the audio, the fact that we on Earth, are completely surrounded in the universe by these enigmas, was something I wanted to articulate through the piece. Exploring this concept using spatial audio techniques, I wanted to envelop and immerse the observer within the world of radio astronomy. At Arup in Manchester, we have a dedicated auralisation suite, which we call SoundLab and 11 others just like it around the globe. These are studio specification listening rooms with multi-channel surround sound systems used to create or recreate three-dimensional soundfields. Day-to-day, I typically use this facility to create accurate auralisations of the built environment; whether that be the inside of a new school, a performing arts building or a new high-speed railway line. On this occasion, myself and Addie used the SoundLab to compose, mix and spatialise the soundscape for Hidden in Plain Sight. Each of the sounds we created were localised with 3D audio space; set out at different distances, surrounding the observer from all sides and immersing them within a stellar soundscape. Movement of sounds represents a constant drifting as well as changes in distance and proximity, as though exploring the data and the transition of signals. Variation in frequency domain communicate heaviness and brilliance, inferring differences in star density, rendering size and texture whilst distortion and modulation simulated artefacts and anomalies that the signals gather on their journey to us. To reproduce the soundscape at bluedot festival 2018, I designed a multichannel spatial audio loudspeaker system specifically to encircle the audience within the Star Field. The soundscape enveloped and immersed observers, extending the work beyond the structure of the telescope and helped to create an atmosphere for observers of the visual projection. It also occurred to me, when lying down beneath the telescope during the installation, that the soundscape also behaved as kind of audio star map, allowing us to hear stars that we couldn’t see whilst staring through the night sky and out into space. Arup’s acoustic consultants are on the cutting edge of audio research, development, modelling and applications using ambisonics and 3D spatial sound. While best known for using these techniques for large-scale projects in the built environment, their acousticians have also a long history of delivering immersive audio experiences in the arts. These include spatial audio for Nick Cave’s The Death of Bunny Munro and a 3D installation of Scott Walker’s Bisch Bosh album. LiDAR* scans of the Lovell Telescope used in the production of COSMOS and Hidden in Plain Sight were also provided by Arup. The telescope was scanned over three days from 50 different positions (30 at ground level, 20 from the top of the dish) at a rate of 50,000 laser points per second, resulting in a high resolution point cloud model of the structure.